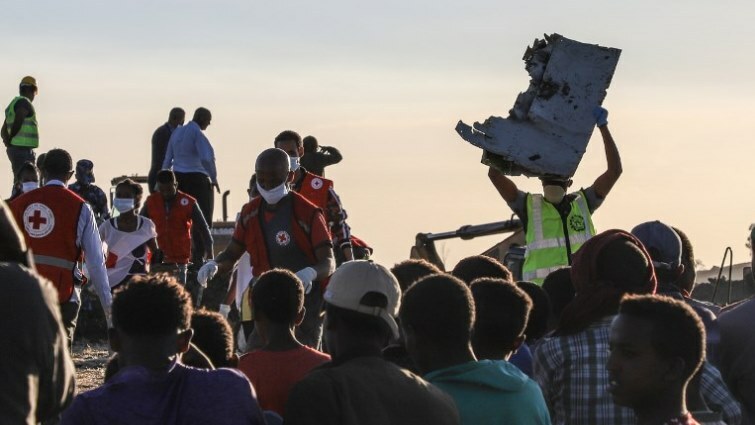 Ethiopia to send black boxes to Europe as questions mount over crash - SABC News - Breaking news, special reports, world, business, sport coverage of all South African current events. Africa's news leader. A man carries a piece of debris on his head at the crash site of a Nairobi-bound Ethiopian Airlines flight. Ethiopia said Wednesday it would send the black boxes from last weekend’s deadly Ethiopian Airlines crash to Europe for analysis as urgency mounted for answers amid safety concerns for the Boeing 737 MAX 8. The second deadly crash involving the plane type in less than six months prompted governments worldwide to ban the American aerospace giant’s bestselling jet from their airspace. The move has heaped pressure on Boeing to provide proof the workhorse is safe. In Ethiopia, families of victims were taken to the remote site Wednesday where the plane smashed into a field with 157 passengers and crew from 35 countries, leaving a deep black crater and tiny scraps of debris. Ethiopian Airlines spokesman Asrat Begashaw told AFP the company would decide by Thursday which country would examine the cockpit voice recorder and flight data recorder recovered from ill-fated Flight ET 302. “We are going to send it to Europe, but the country is not specified yet,” said Asrat. Another airline spokesman, Biniyam Demssie, said Ethiopia did not have the equipment to read the black box data, which it is hoped will provide crucial information about what happened. The Ethiopian Airlines 737 MAX 8 was less than four months old when it went down six minutes into a flight from Addis Ababa to Nairobi on Sunday, disintegrating on impact. Asrat said families of the victims from Kenya, China, America, and Canada, as well as diplomatic staff from embassies, were at the crash site. Experts have pointed out similarities to the crash of an Indonesian Lion Air jet last October, killing 189 passengers and crew. The pilots of the Ethiopian Airlines plane reported similar difficulties before their aircraft plunged into the ground. Boeing came in for criticism after the Lion Air crash for allegedly failing to adequately inform 737 pilots about the functioning of the anti-stalling system. Demssie told AFP the pilots of the doomed flight had been trained. For “every new technology, we provide training at Ethiopian Airlines,” he said. On Sunday, the company’s CEO Tewolde GebreMariam said captain Yared Mulugeta Gatechew, 29, was an experienced aviator with more than 8,000 flight hours. In a separate interview with BBC, he called for all Boeing 737 MAX models to be grounded. A dozen airlines have grounded the plane, while Lebanon, Egypt, Serbia, Vietnam, New Zealand and Hong Kong became the latest countries to ban it from their airspaces Wednesday. All European Union countries, as well as major hubs such as the United Arab Emirates and Australia have already done so. “At this early stage of the related investigation, it cannot be excluded that similar causes may have contributed to both events,” the EU aviation agency said. Low-cost airline Norwegian Air Shuttle has said it will demand financial compensation from Boeing, as the implications of the mass grounding for the airline industry remained unclear. The United States, however, is resisting calls to ground the MAX series, which is Boeing’s fastest-selling model, with more than 5,000 orders placed to date from about 100 customers. Federal Aviation Administration (FAA) chief Daniel Elwell said in a statement on Tuesday. There are about 350 MAX 8s in service around the world. Thomas Anthony, head of the Aviation Safety and Security Program at the University of Southern California, said increasing automation of planes means crews have less experience flying manually. “So it’s not just a mechanical, it is not just a software problem, but it is a problem of communication and trust,” he said. This entry was posted on 13 Mar 2019,03:38PM at 3:38 PM and is filed under Africa, News, Homepage Latest Stories Slider. You can follow any responses to this entry through the RSS 2.0 feed. Both comments and pings are currently closed.